Both times we called ahead and ordered take-out that was ready quickly. Dine-in eating is also offered, with about 8 booths and 4 tables available for seating in the newly renovated space. Monday-Saturday a very affordable lunch buffet is also offered that I have yet to try. 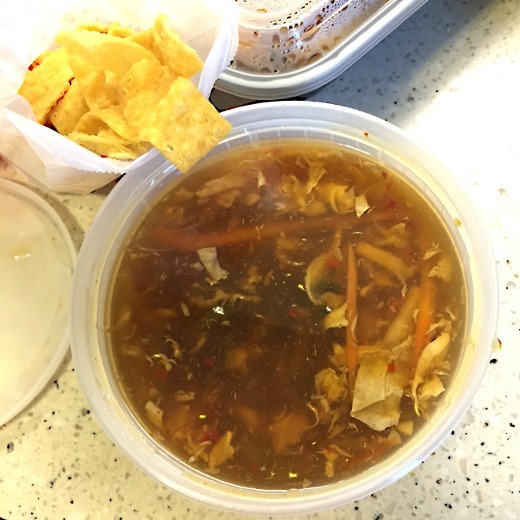 I pretty much can’t order Chinese food without getting Hot and Sour Soup because I love it. Chopsticks’ comes with crunchy wonton pieces. Their soup is quite good – I’d like even more heat though. I ordered it on both visits. 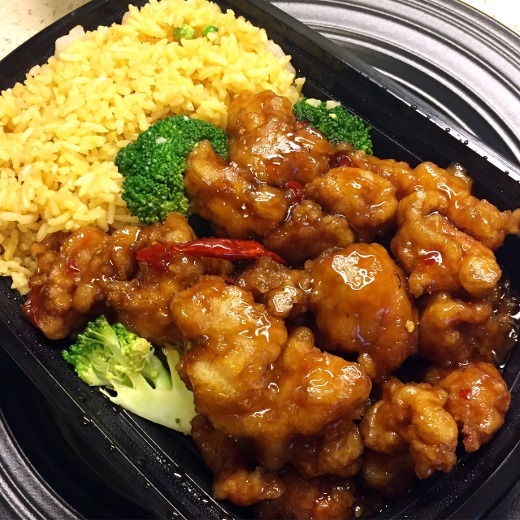 Chopsticks’ General Tso’s Chicken is exactly what I am looking for when I am craving the stuff – thick breading, tender meat, served hot and fresh with lots of tangy sauce. It’s great. We ordered it in a combo that comes with fried (or white) rice and an egg roll. 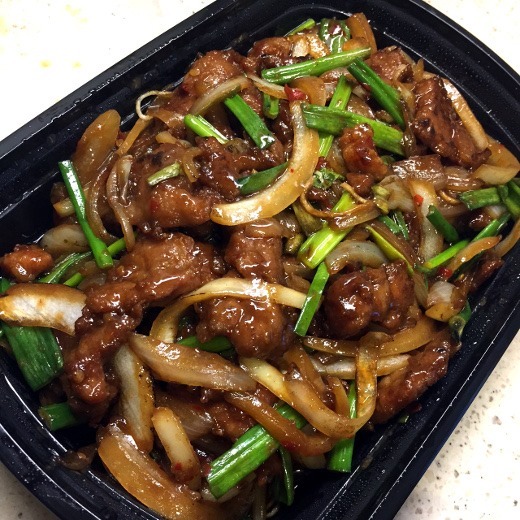 We also tried the Mongolia Beef on our first visit – fairly tender beef (just a few tough pieces) with soft onions and scallions in a savory sauce. Huz and I like to order a couple things and split ‘em 50-50. We tried the crab cheese as well – solid! 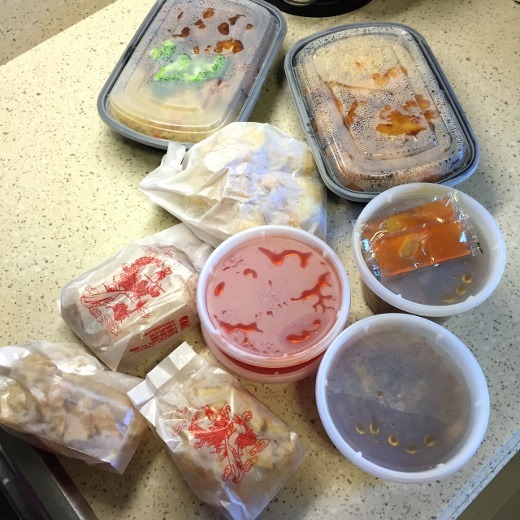 Overall though, our first take-out experience was great! 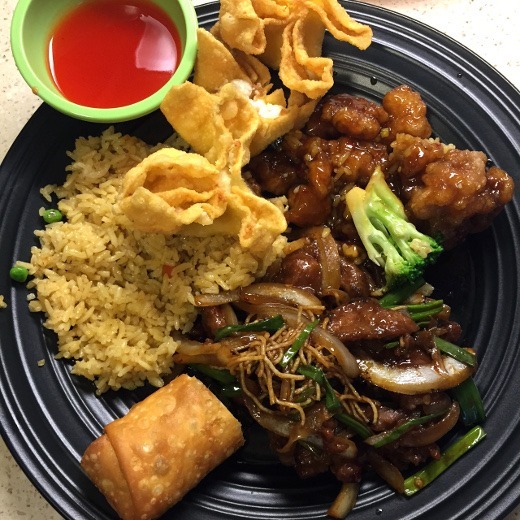 On our second visit, I was in a chicken mood so we again ordered their fantastic General Tso’s Chicken, along with an order of Sweet and Sour Chicken, which was also great! The chicken they use is tender but with no weird fatty grisly bites that you sometimes get at some Chinese restaurants. 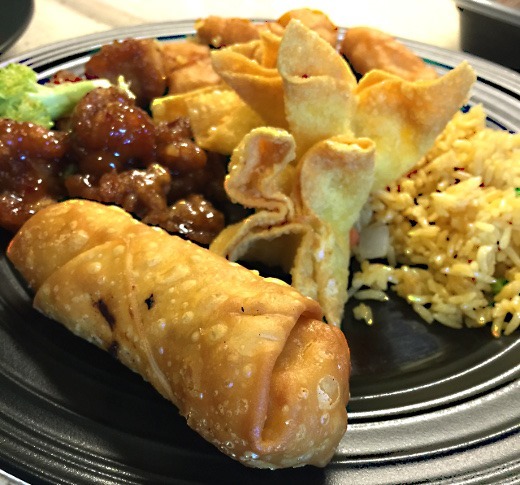 The egg rolls are pretty good but not the best ever – I prefer the filling to be more finely julienned and to have more seasoning. All in all, we really like this addition to Ann Arbor and will definitely be ordering more take-out from them in the future. Went there with the wife a few weeks ago. I cant remember what we ordered but one was really good, the other really bad. We really like Joyful House in Saline. From where we live Chopsticks is geographically closer, but with all the stoplights (which are impossible to catch when green) it takes us longer . I have a rave review of Joyful House coming soon too! 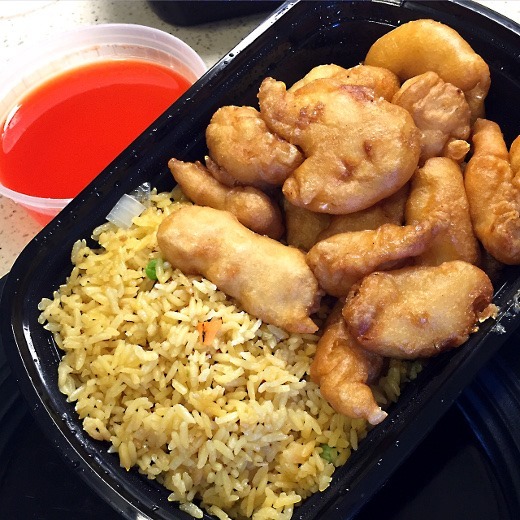 We are moving closer to JH this summer so I imagine it will become our new go-to Chinese take-out spot. My only complaint about them is that theyll take vacations and shut down every so often. Damn their work-life balance. Looks fantastic! I’ll have to go check that place out sometime. There is this hole in the wall place in Frankenmuth that Gabe and I absolutely love. This makes me want to go, hehe.